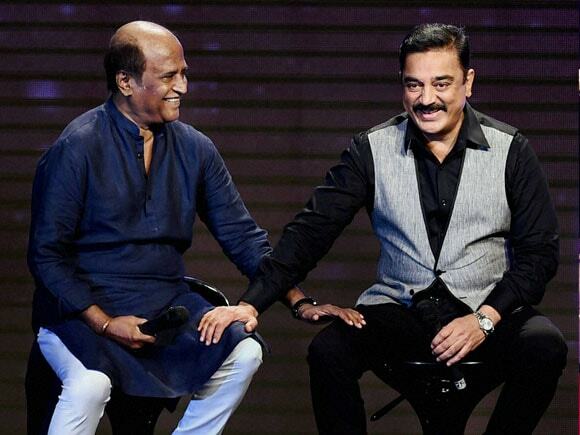 Bollywood actors Kamal Hasan and Rajinikant during the music launch of film 'Shamitabh' in Mumbai on Tuesday night. Bollywood actor Abhishek Bachchan and Aishwarya Bachchan during the music launch of 'Shamitabh'..
Bollywood actor Abhishek Bachchan and Aishwarya Bachchan during the music launch of 'Shamitabh' in mumbai on Tuesday night. Bollywood actress Sri Devi along with actor Kamal Hasan during the music launch of film 'Shamitabh'. Bollywood actress Sri Devi along with actor Kamal Hasan during the music launch of film 'Shamitabh' in Mumbai on Tuesday night. Bollywood actor Kamal Haasan with daughter and actress Shruti Hassan during the music launch of 'Shamitabh'. Bollywood actor Kamal Haasan with daughter and actress Shruti Hassan during the music launch of film 'Shamitabh' in Mumbai on Tuesday night. Bollywood actress Sri Devi felicitating music director Ilaiyaraaja. Bollywood actress Sri Devi felicitating music director Ilaiyaraaja during the music launch of 'Shamitabh' in mumbai on Tuesday. Bollywood actress Akshara Hasan during the music launch of 'Shamitabh' in mumbai. Bollywood actress Akshara Hasan during the music launch of 'Shamitabh' in mumbai on Tuesday.